Abundant rainfall in January and February 2019 bodes well for the forthcoming Central Valley strawberry season, reported Reuben Contreras on ABC Channel 30 Action News in Fresno. 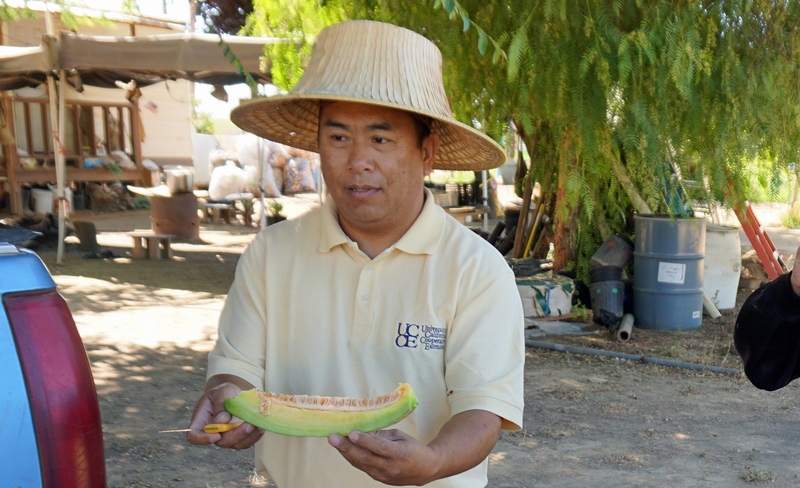 Contreras interviewed Michael Yang, small farms and specialty crops Hmong agricultural assistant with UC Cooperative Extension. "We need the water as much as we can right now," Yang said. He said the rain will add to the groundwater supply most farmers use to grow their crops, plus it will make the strawberries sweeter. Cool weather is also welcome. "Strawberries need cool weather but in the summer, the hot weather with the variety strawberries will not survive the heat," he said. In the San Joaquin Valley, strawberries are picked from late March to early June. If the wet weather pattern established in January and February continues through the spring, that could spell trouble for strawberry farmers. Wet strawberries can rot in the field. The rainy winter means sweet strawberries are on the way, says UC Cooperative Extension small farms and specialty crops Hmong ag assistant Michael Yang. The photo shows Yang with an Asian melon in summer 2018.